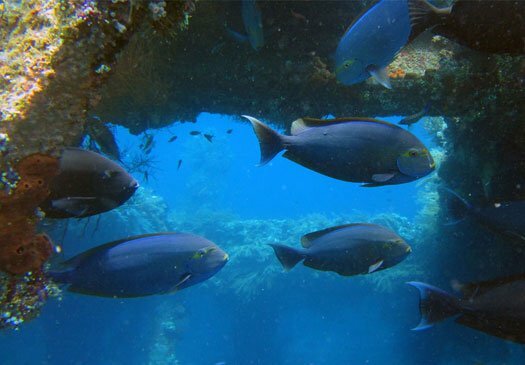 Dive Tulamben and you will dive on one of the most famous scuba dive spots in the world: The USAT Liberty Wreck. The wreck is covered in corals and fans and is home to a variety of marine life. Tulamben can be found in the North East of Bali. But there is more in Tulamben: dive on the Drop Off or the Coral Garden or join us on one of our day trips to Kubu, where you find another relatively new wreck. All dives here are shore dives. 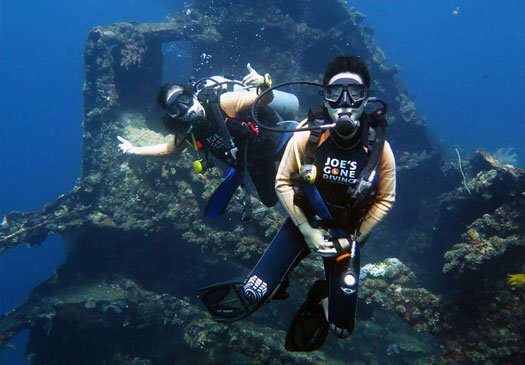 Joe’s Gone Diving offers day trips to Tulamben and Kubu. While sailing the Lombok straits in 1942 the USAT Liberty, a cargo ship during WW II, was hit by a Japanese torpedo. Two destroyers attempted to tow her to Singaraja, but it was too late and she was beached in Tulamben instead. 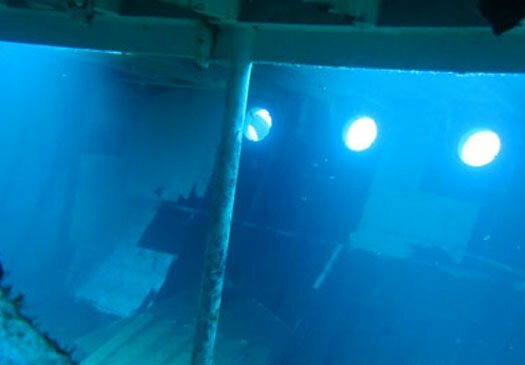 During the eruption of Mount Agung, 20 years later in 1963, the ship rolled into deeper water and broke at bow and stern. The USAT Liberty has been lying there ever since. Usually the visibility is good, the water calm with limited current, making this an excellent dive site for all levels. The shipwreck is about 120 metres long and many species live there. The wreck is accessible and can be entered. Blue spotted stingray, groupers, bumphead parrotfish and huge, swirling balls of big eye jack fish are frequently encountered here. If you are lucky you might also come across one of the great barracudas or a turtle.. The Drop Off is a beautiful wall dive. When diving on the top of the wall, you will normally see moray eels, cuttlefish and the occasional octopus. Big gorgonian sea fans can be seen, the coral is beautiful, the reef life abundant. When you think your dive has come to an end keep your eyes open and follow the shore line for another minute or so, normally you will see huge groups of jack fish. Right between the USAT Liberty and the Drop Off you can find the Coral Garden. This is an easy, shallow dive which photographers will love, the sun can reach the bottom during the day, and there are many diverse species that are worth having their picture taken. 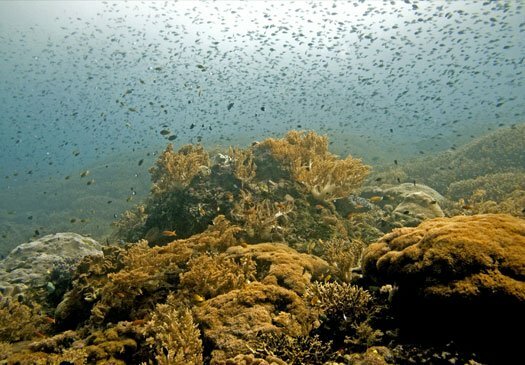 The Coral Garden, as its name already indicates, is an area with abundant healthy coral. 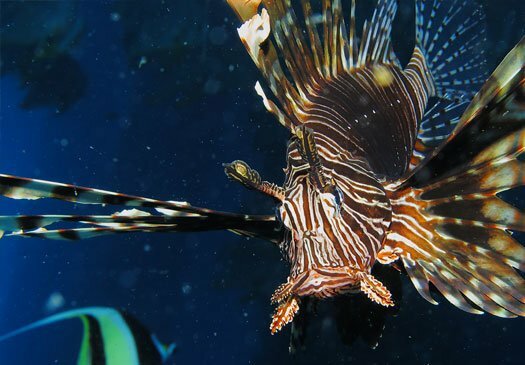 Often you can see ribbon eels, leaf scorpion fish, lionfish and octopus here. Several white-tip reef sharks have made their home here, so they might occasionally swim by. A fantastic way to spend your afternoon. Monkey Reef is named after the Monkey Bungalows that were once based there. 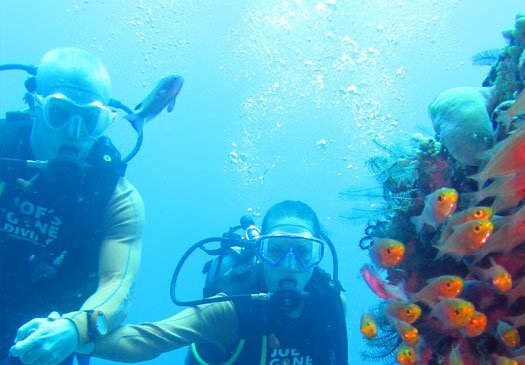 In this coral garden you find abundant beautiful coral reefs combined with swirling fishes. The colourful coral reefs, the many fishes and the variety of nudibranchs make this a great dive. This site has a sloping bottom. Usually a very relaxing and easy shore dive. The Kubu wreck was sunken in 2012. It is often called the Ghost wreck or the Relax Bali wreck after the resort in front of it. Even though it has been there for such a short time only, marine life has already made this their new home. The wreck starts at 18 metres and is therefore appropriate for advanced divers. You access the wreck via the coral garden. You can encounter schools of barracudas, triggerfish and groupers on this shore dive. The wreck itself is still intact. For some great muck-diving, also check out Seraya.